Kentucky does not need to look far for inspiration ahead of Saturday’s SEC East showdown against Georgia. 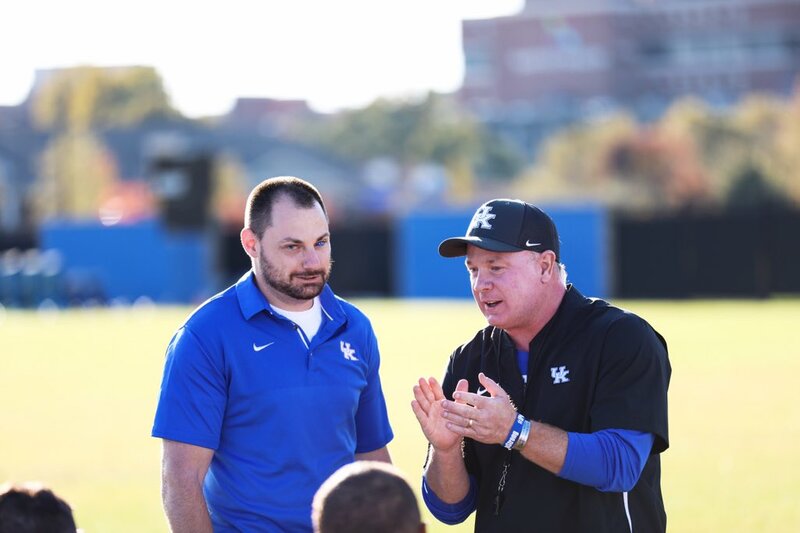 Mark Stoops hosted a special guest after Monday’s practice, Marine veteran Matthew Bradford. The first double-amputee to ever re-enlist in military service, Kash Daniel took Matthew’s message to heart. Kentucky’s defense passed their test against Missouri’s high-powered offense. On Saturday they’ll be tested by a balanced unit that was a few plays away from a National Championship. UK’s middle linebacker was not at full strength against Mizzou. Kash was forced to wear a protective club over his left hand. It was a nuisance, to say the least. He’s worked extra reps in practice to perfect his roll tackling form. Kash will not let it be an excuse, thanks in part to the example Bradford has set. The Kentucky defense has been terrorizing opponents all season. It only makes sense that the defense spoke to the media on Halloween. Mike Edwards was the man hiding behind the white mask. Unfortunately, Tony Neely would not let the Badger start the interview until he removed his mask. Josh Allen was not in costume, but don’t let that fool you. “I’m the Boogeyman today, if you cannot tell,” he said with a smirk. Kentucky’s Boogeyman has raised hell in backfields all year. Now he’s made his mark in Times Square. His family couldn’t believe what they saw online, so they went and saw it for themselves. Almost as awesome as what’s going to happen Saturday night. Kentucky’s defense absolutely dominated Missouri in the second half, forcing the nation’s No. 12 offense to go three-and-out eight straight times. Mark Stoops said after the game he doesn’t think he’s ever seen anything like it in all of his years of coaching. The players felt good after the game, but were brought down to Earth in the meeting room on Monday. All Matt House needed to do was play the first half film. Kash Daniel personally took responsibility for the 14 first half points after a pair of costly mistakes. That message has been a focal point of the defense all season long. It’s not changing against Georgia.